There is much discussion about which are the best opera houses in the world, but there’s no doubt that the Vienna Staatsoper will always rank among the most highly regarded. Occasions arise when the discussion is pointless, and this Easter week is one of them. Over four days, the Staatsoper program includes a new production of Elektra with Nina Stemme as the lead, Parsifal and an excellent cast, Rosenkavalier with the presence of Elina Garanca, and Anna Bolena with Anna Netrebko as the unfortunate Queen of England. It is not easy to resist a program like this, and I decided to yield to the temptation. One can debate the primacy of opera houses, but there is no discussion among opera lovers as to Nina Stemme being the best dramatic soprano today. Her Brünnhilde is unrivaled, as is her Isolde, and now Richard Strauss’s Elektra can be added to the list. She has proven to be the worthy successor to another exceptional Swedish Elektra, Birgit Nilsson. Nina Stemme has everything required for the part, and that was evident in Vienna where she was making her debut in the role. Both dramatically and vocally she flew very high, with a beautiful and powerful middle range, good low notes, and an outstanding top register. Add to all this her convincing dramatic skills, and it is indisputable that she has become today’s Elektra. 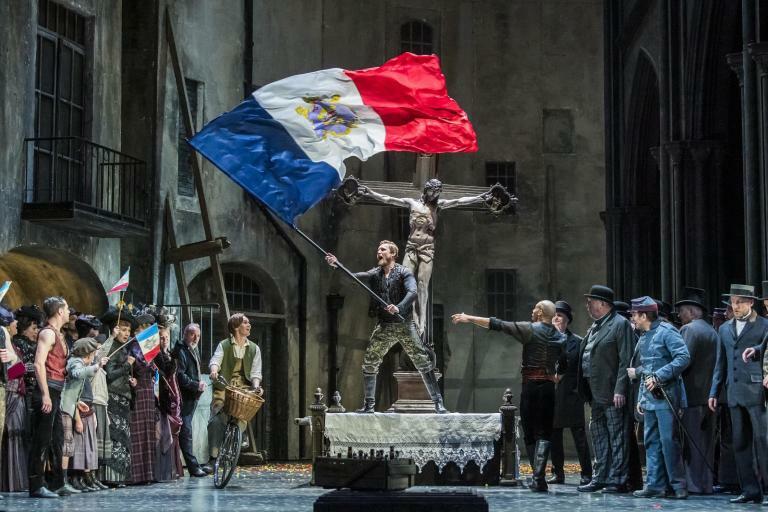 For such an important debut, the Staatsoper commissioned a new production by German director Uwe Eric Laufenberg, who brings the action into the time when the opera was premiered. It takes place in the basement of Klytämnestra’s townhouse where Elektra lives, with a pile of coal on one side, a tiled shower on the other, and the center occupied by an elevator that runs up to the main floors. The costumes are very well suited: Klytämnestra is particularly elegant, and Elektra wears a man’s double-breasted suit, underscoring that she has lost her female identity. Laufenberg narrates the story effectively, focusing on Elektra, who will change out of her male clothes when she recognizes her brother, Orestes, in a more or less incestuous scene between the two. The scenes of the protagonist with her mother and her sister are also quite good, but there’s a series of unnecessary and controversial details in the production which add very little. Among them I would highlight some naked maids seen at the beginning of the opera; the display of bloody corpses in the elevator at the end; and the fact that Elektra shows her final joy not alone but accompanied by a dance group which makes her death seem less credible. These performances were programmed under Franz Welser-Möst, who resigned from his post as music director of the Staatsoper a few months ago. The musical direction passed into the hands of Mikko Franck, and I have to confess that for me his greatest handicap was that my recent Elektras were under the batons of Esa-Pekka Salonen and Christian Thielemann. Obviously, it was not the same: Franck was thoroughly competent, even brilliant at times, but not the outstanding conductor that the occasion demanded. The much-expected moment when Elektra recognizes Orestes, one of most moving of the entire opera, went almost unnoticed. The Orchestra of the Wiener Staatsoper showed their quality, although I have heard better from them in the past. As I mentioned above, Nina Stemme’s debut in Elektra could not have been better. The rest of the cast was very good, and even the substitutions were fortunate. The character of Chrysothemis should have been covered by Anne Schwanewilms, but she cancelled shortly before the premiere and was replaced in the first performances by Ricarda Merbeth. In this performance, Chrysothemis was sung by German soprano Gun-Brit Barkmin, who was excellent in terms both of acting and singing. Seldom have I seen such a bright and intense interpretation. Swedish mezzo soprano Anna Larsson was an outstanding Klytämnestra on stage, although less so in vocal terms. Her regal figure could not be more convincing, and her voice is attractive, but the bottom register is rather weak and, in general, her volume is limited. Falk Struckmann was a sonorous Orestes, much better here than I’ve seen him recently in a different repertoire. Norbert Ernst went unnoticed as Aegisthus. The Staatsoper was packed, and the audience showed their enthusiasm with standing ovations for Nina Stemme and, to a lesser extent, for Gun-Brit Barkmin. Mikko Franck was greeted with cheers and some boos.